Aniseed Myrtle (aka. ringwood) is a relative of the Lemon Myrtle with an aniseed and fresh eucalypt flavour. Its edible leaves are typically consumed fresh or dried and powdered, and were used traditionally as a medicinal tonic. In the wild, it is found natively in the sub-tropical rainforests of eastern Australia. Leaves are aromatic, often distilled for their essential oil. They may be used fresh or dried in tea, or ground up and added to bread dough, biscuits, stuffings, syrups, glazes, dressings and meat dishes. Aniseed Myrtle boasts a superior antioxidant profile, and is high in vitamin C, E, folate, lutein, zinc, calcium and magnesium, as well as chlorophyll a and b. As the leaves grow back quickly, you’ll have a fresh harvest throughout the year. Simply choose firm leaves that don’t crack easily, and pluck them straight off the tree. Aniseed Myrtle prefers well-drained, nutrient-rich soil in a sunny position, but may also be grown in part shade. Established trees are relatively hardy and will tolerate dry weather. Younger saplings may need to be protected from both drought and hard frosts. This plant’s lush green ornamental foliage will need pruning in the first few years to encourage leaf growth and kickstart an attractive shape. Leaves start out soft and pink, becoming green and glossy once mature. White scented flowers will appear in the Spring, creating a stunning and fragrant display. In their natural rainforest habitat, Aniseed Myrtle trees can grow as tall as 45 metres, but are easily maintained as a shrub or small tree in a backyard garden. This plant is great as a gap filler, or as a potted edible ornamental. How should I fertilise my Aniseed Myrtle? 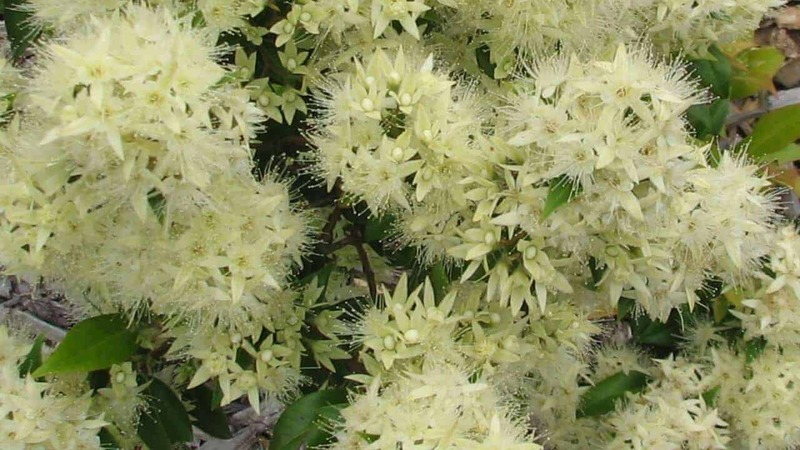 How can I get essential oil from Aniseed Myrtle? Leaves and twigs may be steam-distilled to extract the essential oil at home. Or, if you don’t have distilling apparatus at home, you can purchase the Aniseed Myrtle essential oil online. What are the little specks all over my Aniseed Myrtle branches?